After two nights in Seattle, my brother and I took the 4-hour Amtrak ride to Portland and stayed there for three nights. 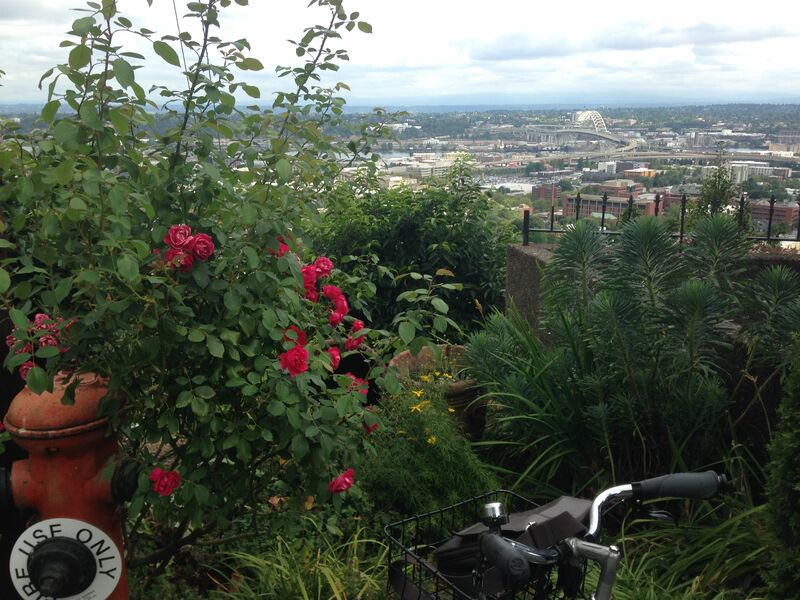 The city view of Portland from the hill towards where Forest Park is. Definitely do it! Especially if–like me–you don’t come from a biking-friendly city, it’s a really interesting experience! I got my bike from Portland Bike Tours and Rental; single speed for 24 hour plus the next day until 6 PM for $50, including night lights, lock, and helmet. It’s pretty costly, I admit, so if you’re concerned about money, renting it for a day should probably do the job to get the fun biking experience and at the same time, to not spend too much money. I went biking downtown and around Pearl District. It’s really easy to navigate your way even if you have no previous experience biking in the city. For directions, I used Google Maps on my phone, and I used an armband so I didn’t have to hold my phone while biking. Most roads in Portland (at least the parts where I’m staying) have bike lanes. Even if they don’t, car drivers are really cautious and I think it’s safe to ride your bike pretty much everywhere around the area. Look at all of the book categories this place has! The place every book lover has to go! It’s huuuuge (right, it’s the largest independent bookstore in the world) and obviously offers so many different books! It got to the point where I found the options got too overwhelming and I simply couldn’t make up my mind on what to get. (Fun fact, if you haven’t known: research actually points out the same thing that having too many options doesn’t do any good.) Also, I can always borrow books from the school’s library for free, so yeah, better use that college perk, right? 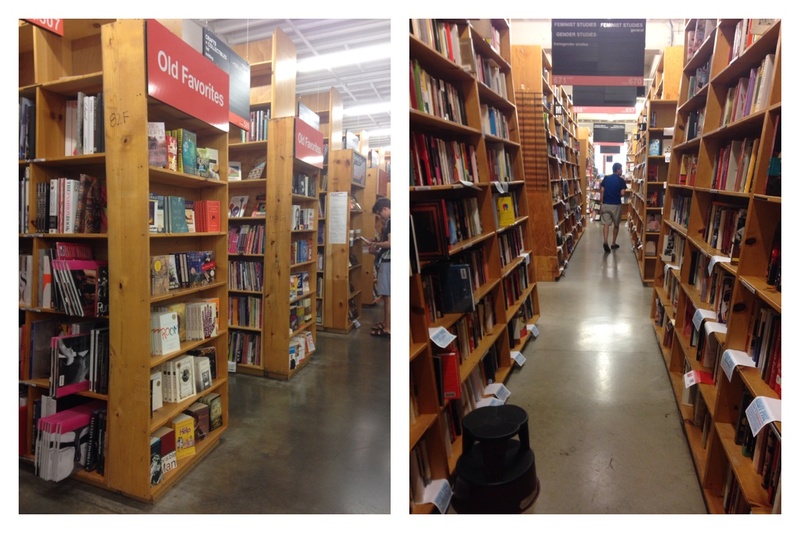 Anyway, Powell’s Books is such a famous place I probably don’t even need to talk about it. Aside from books, it also has a wide selection of stationaries, collectibles, and souvenirs. A bookworm’s kind of paradise. A bunch of food trucks selling all sorts of food, from various Asian cuisines, Middle Eastern, even Eastern European ones. I was walking around the food trucks and deciding what I should get for lunch when I stumbled upon Satay Indonesia. The truck itself is nicely decorated with a touch of a typical “warung” decoration to it. Living in Providence, I should say that having decent Indonesian meals has become such a luxury that I always get excited whenever I spot Indonesian food! 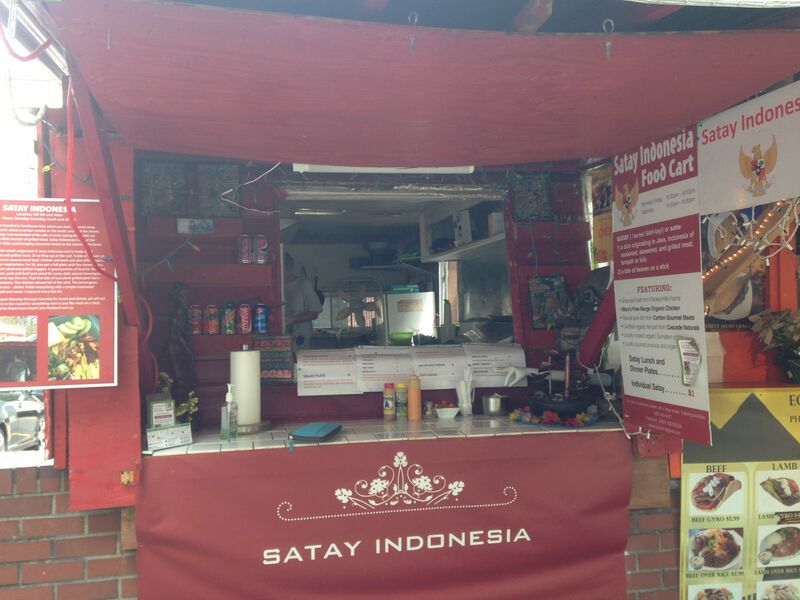 Satay Indonesia food truck, spotted–looking nice with the typical warung decoration! I got the tempe salad for $6, which had properly-cooked tempe (fried until crispy and drizzled with a generous amount of Indonesian sweet soy sauce!) and a side of shrimp crackers on top of a bed of assorted vegetables. The tempe is definitely the highlight of the dish! The seller (who was Caucasian but was born in Sumatera, tiny fun fact) used peanut sauce as the salad dressing, which I really like. But other than that, there isn’t really anything special about the salad, though it was tasty. He also gave my brother and me one tester satay skewer each, and it tasted pretty good although the seasoning is different than the one we normally have in Indonesia. 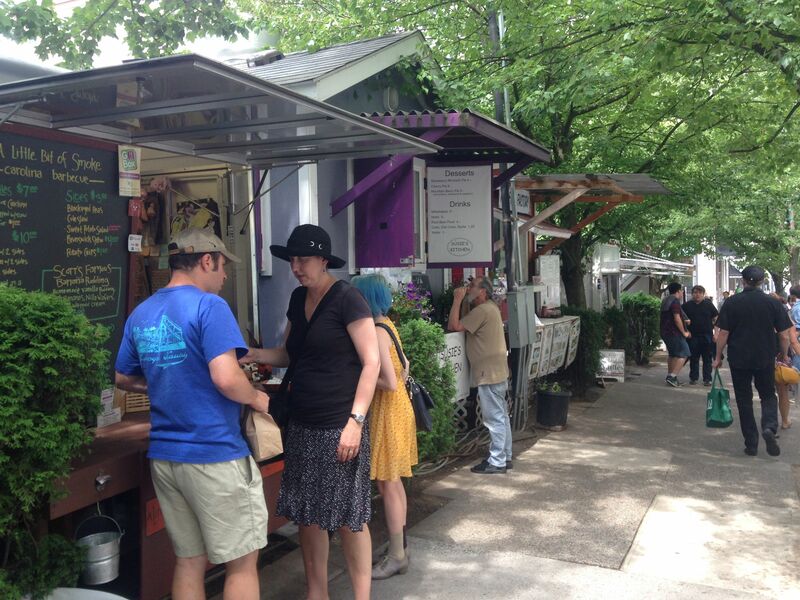 But yeah, give it a try if you happen to spot Satay Indonesia amongst the parked food trucks in downtown Portland! Voodoo Doughnuts. 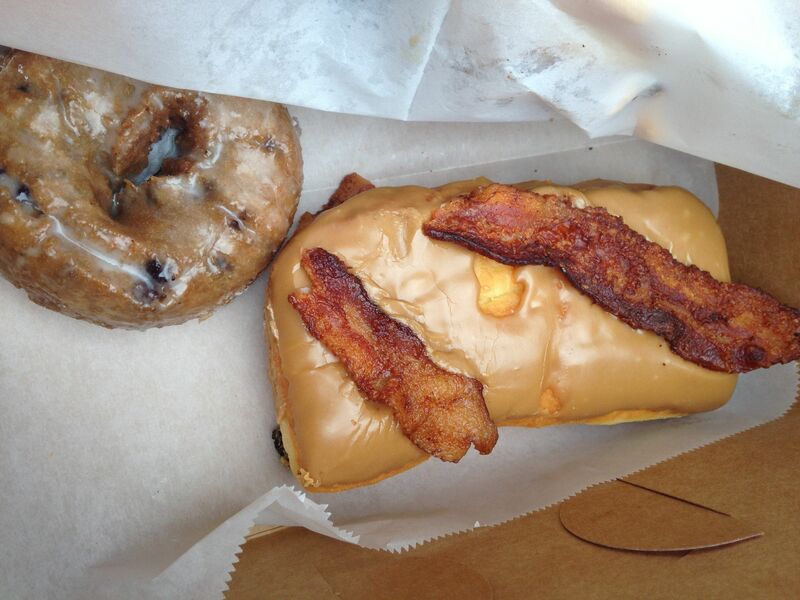 (Left) Blueberry donut (Right) Bacon maple donut. I wouldn’t recommend the Bacon Maple donut that a lot of people have been crazy about. I simply can’t understand what’s appetizing about the weird combination between savory, greasy bacon and overly-sweet maple. Instead, I find the slightly less famous option blueberry donut worth a try. The donut itself isn’t too sweet, which I really like, and is nicely sweetened with the sugar glaze. My Airbnb host also told me that its vegan options taste better than the regular ones! Be careful with streetcar railway lanes. One of my bicycle’s wheels got stuck inside and made me tripped (twice!) Luckily the car behind me was moving slowly and I managed to still control my balance. (At least enough not to make a fool of myself or even worse, injure myself!) Also, if you’re planning to go biking to Forest Park or any other places away from the city with various route inclines, definitely do your research. I only used Google Maps and seeing that Forest Park was only 15-minute bike ride away from the place I stayed, I tried to bike there using my single-speed bicycle–which, I can assure you, is not a good idea–not to mention the fact that my biking skill is limited to only daily spinning class I did at the gym back home. That said, I really enjoy the experience and the workout to compensate for all the food truck food I ate! Stay in Pearl District for a short trip in Portland! The location is unbeatable. There are so many restaurants and bars around, especially on the 23rd Street, which you should definitely go to! It has a good amount of “hipster” Urban Outfitters-style shops (ranging from clothes to accessories to scrapbook place) and restaurants offering different types of food. (I recommend Bamboo Sushi, and definitely go for their Happy Hour from 5-6 pm!) As for me, the Airbnb where I was staying at was only 10-minute walk from the Union Station and 20-minute walk to Chinatown and downtown Portland (which includes pretty much most of the major tourist attractions, such as Powell’s Books and Voodoo Doughnuts). It’s really easy to get around using the Streetcar–which costs you $1 per ride and comes every 7 minutes–though I never used it during my stay because I rented a bike for two days. The conclusion: I really like Portland! This is my first time going to a city that has demonstrated quite a significant “green” effort: adequate bike lanes, urban parks, really convenient and efficient public transportation, and basically the apparent “green” vibe and message. I have been obsessed with Danish sustainability for a while, though unfortunately I haven’t had the chance to visit the city, so for now, having experienced Portland is good enough for me!